This work was created during the WoW/UNY Governors Island Residency. Sto Len and Maggie Haslam were in residence on Governors Island from July 23-August 5, 2018. Artist Statement, Sto Len: When I first arrived on the island, I began walking the perimeter in an attempt to be as close to the water as possible. I collected things I found along the way: sticks, leaves, fish bones, rocks, sea shells, and a bucket of water from the Buttermilk Channel. I brought all of this back to the house and filled my inflatable swimming pool with the water, which would be my canvas for the duration of the residency. My daily art practice is a kind of meditational printmaking on the surface of water. I paint with oil and enamel floating on the water, along with other natural debris that creates a colorful stew. Patterns emerge over time, and then I lay paper down to capture the moment with a monoprint. I noticed my studio neighbor, Maggie Haslam, was using water on paper too. She formed puddles on her works and was allowing time to have its way, eventually drying into colorful organic forms. She saw the similarities in my work, too, and we began trading paper back and forth, printing and puddling on them until the pieces seemed finished. We continue to collaborate following our residency, trading work through the mail. Artist Statement, Maggie Haslam: While working on Governors Island, I used collected water from the river and from rain water in my paintings. I wanted to give the water a voice, and so I allowed it to be a tool, limiting my use of a paint brush. Instead, I used methods of pouring and dripping, allowing the paint to settle onto the paper to create an image. Sto worked in the studio next to mine, and we realized right away that we both used water's natural flowing characteristics as a primary method to create imagery with our paint. The outcome of each of our processes is a moment of the water's movement that is captured on paper. Sto Len: My current body of work transforms the traditional printmaking art of Suminagashi (floating ink) into an experimental collaboration with nature and a site of discourse on environmentalism and art activism. Working en plein air (often from a boat), I use my own marbling-like process to print directly off of the surface of urban waterways with paper. The end results are ghostly imprints that contain both the natural and anthropogenic residue of the site’s history. During these urban explorations, I document my journeys with photographs, video, collections and field recordings that give visibility to a city’s unseen and neglected watershed areas. These trips have also recently include memory walks open to the public, site-specific interventions, impromptu bbqs, water rituals, and solar-powered noise concerts. Recent work in New York, Rhode Island, Colombia, and Vietnam has enabled my studio to be as large as a river and a practice that is becoming increasingly nomadic and global. 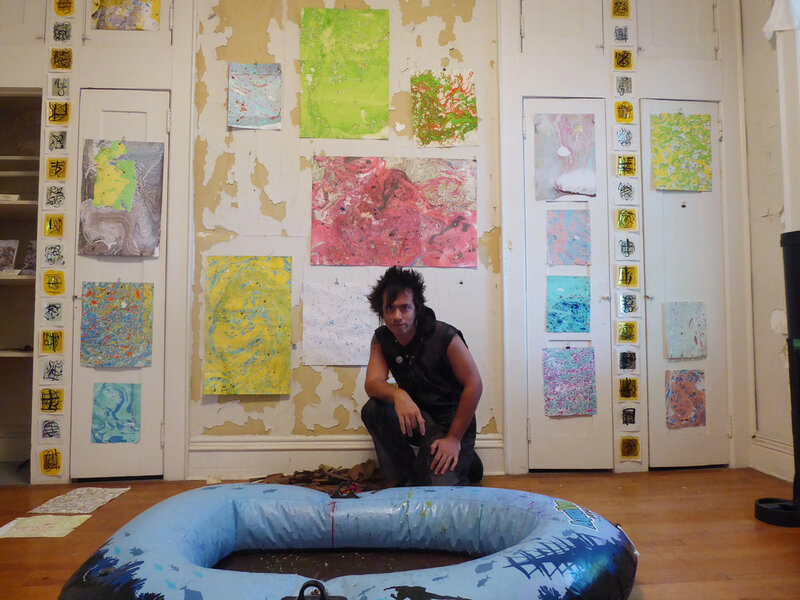 In between travels, I maintain an ongoing studio practice using controlled bodies of water in inflatable swimming pools with combinations of oil paint, dirt, spray paint, and extended periods of time, to create colorful, patterned compositions on paper, maps, found materials, and wood that celebrate the materiality of water and the immateriality of memory. Maggie Haslam (born 1988) grew up in Washington D.C. and received her BFA in studio art from BYU in 2013. After graduation, Maggie moved to New York City, and continued her art education at Pratt Institute, receiving her MFA in painting in 2016. Maggie primarily works in water based paints on paper. She designs situations where she relinquishes total control over the medium, allowing the flowing characteristics of the paint and water to act naturally on paper. The end result is often simply the process caught in the act. Since 2017, Maggie has collaborated with a fellow artist in a residency program located in Beginning with Children Charter School in Brooklyn, New York. They have worked together with the help of the middle school students on a project relating to immigration and displacement. In the summer of 2018, Maggie received a residency on Governors Island, New York with Underwater New York/Works On Water where she used only collected and recycled water to make art with. Maggie has been teaching children in Upper Manhattan/Westchester with Scribble Art Workshop since 2017.